The Skanner News - How Would You Spend $200 Million? How Would You Spend $200 Million? If you had a lot of money to spend – say $200 million — to develop North and inner Northeast Portland, what would you do? That's the question the Portland Development Commission soon will be asking people who live and work in and around the Interstate Urban Renewal District. "Between the years 2013 and 2021 there's almost $200 million dollars in what I would call unobligated capacity for Interstate," John Jackley, the PDC operations division manager. "It's true that 2013 seems a long time away, but projects take a long time to develop and to make happen. So now is the time to start looking at potential projects to put into the budget four years out." But the $200 million that hasn't yet been budgeted is just part of the urban renewal story in North and Northeast. Right now funds are available to help first-time homebuyers, to expand small and medium-sized businesses and for people who want to revamp buildings. The storefront project, for example, is helping business owners along Killingsworth Street, Martin Luther King Jr. Blvd., and elsewhere to upgrade the look of their stores. Even the boundaries of the urban renewal districts are flexible. Some people have suggested that Martin Luther King Jr. Blvd, should become part of the Interstate urban renewal area, instead of the Oregon Convention Center area, which is due to expire in 2013. Right now the PDC is wrapping up planning for Portland's downtown urban renewal areas, Jackley told The Skanner. But by July, the development agency will turn its attention to the north side of the Willamette River. The agency wants to hear from community members and stakeholders in North and Northeast Portland, about how the urban renewal money should be spent and how to make sure as many people as possible are included in setting these priorities. 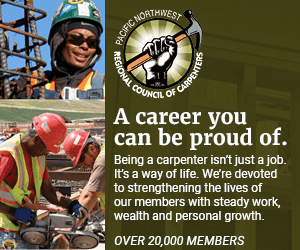 "We are really committed to connecting better with the community, increasing our involvement in North and Northeast Portland and demonstrating that North and Northeast Portland are really important to the PDC and to Portland," Jackley said. "There is no predetermined outcome to this process. We want to develop these outcomes and the benefit for the community with the stakeholders and the people who live there." The agency plans to reach out to neighborhood associations, chambers of commerce, business groups and churches, in addition to Urban Renewal Planning meetings. Pauline Bradford, a longtime resident is a member of the both the Oregon Convention Center and the Interstate urban renewal area committees. "My commitment was to see that whatever they did, that they treated the people already living in the area fairly and that they didn't completely displace everyone," she says. "The way gentrification came floating in so fast – with the prices going up so high for housing, it has made it a little difficult for people on fixed incomes ... So we are pushing for some kind of special program for people who need a little extra help to stay." Jackley said in North and Northeast, allocating funds for affordable housing and support for small and medium sized businesses is helping to minimize this problem. But he'd also like to see legislation that helps people keep their homes. "There has to be a way for senior citizens to remain in their homes in the face of rising property values …" he said. Bradford said if the new money is spent wisely, the community could see many benefits. "Especially if they are able to create jobs in the area, and especially jobs people can access ..," Bradford said. "If jobs can be created during the process and if the shift is done humanely, in the end it will benefit everyone in the city." Algie Gatewood, president of Portland Community College's Cascade Campus said he definitely will take part in setting priorities for investing urban renewal funds. Education, especially employment related education, should be near the top of any wish list, he said. Gatewood said money spent on expanding PCC Cascade's facilities would help deliver education and training to more people. The construction trades program, for example, prepares people for apprenticeships. "It helps people get into sustainable employment with health benefits and good wages that allow them to really take care of their families," he said. "Instead of people being displaced from their homes, they can enjoy the benefits of this development through working on these new construction projects." Gatewood said PCC's health and business programs are other areas of possible expansion. Metro Councilor Rex Burkholder said Martin Luther King Jr. Blvd. could still benefit from urban renewal money, so adding it to the Interstate area might make sense. "It's been my neighborhood for almost 30 years now, and it's much improved but we still have a lot of empty storefronts and one of the biggest lacks is, I think: we need to do more housing, and that goes for Interstate as well," he said. "Because you need more people to support the kinds of things that people want, the commercial retail development that people would like to see. You need more people, more money in the community. Sometimes that comes from having rich people, like in the Pearl. In other places it's just having enough people." Burkholder said some high-density housing, such as four-story condos and flats along Interstate, would help create a stronger market for local business. Affordable housing is important, he said, but all kinds of housing will help the neighborhood. John Branam, a candidate for City Council position 1, said investment has to be targeted carefully. In North Portland, it makes sense to support affordable housing, small and medium-sized businesses, he said. Branam said he'd like to explore how the funding could help create jobs through a Green Job Corps similar to a successful project in Oakland, Calif. That project works with unemployed low-income people, including many young people of color, offering them employment skills in the new "green economy." Jobs in the 'green economy' range from cleaning up polluted 'brownfield' sites to installing solar panels, insulating homes and businesses. "A green job corps that is co-sponsored by the PDC, the Bureau of Housing and Community Development, Portland Community College and Portland Public Schools could be very powerful, not only for stimulating job growth in North and Northeast Portland, but assisting us in meeting our carbon reduction goals…," Branam said. Nick Fish, a candidate for City Council position 2, said ideas for projects will come from the community clearly setting priorities for development. "Something we can all get behind is both how we strengthen Jefferson High School, and how to build family housing – so we keep families in this community," he said. Fish said it should be possible to bring needed services to the community, "I'd like to see the City site some of its facilities in North/Northeast." Expanding PCC, supporting community businesses and building affordable housing, should be part of the mix, he said. "My bias is: let's support people who are here and want to grow their businesses first," he said. "They've been paying their dues."